article, even though it's 30 years old, ECL is more radiation resistant than normal CMOS chips by a factor of 1000. It is also less susceptible to DPA side-channel attacks. So in particular, are ECL chips used on military hardware/spacecraft current? The killer for CMOS built on bulk silicon is the current that radiation produces in junctions that are supposed to be providing isolation. One way around this is to build CMOS on top of an insulating substrate, such as sapphire. The lowly RCA 1802 "COSMAC" processor was used in a number early satellite projects precisely because it was available in a SoS (silicon-on-sapphire) process that was inherently radiation-resistant. You need to be very careful when you talk about "radiation". The article you linked is talking specifically about cosmic rays, which are single nuclei that have extremely high energy. When one of these nuclei passes through silicon it frees many electrons, which may then be collected by any existing electric field and result in unwanted current. It is generally true that bipolar technologies are less susceptible to cosmic rays. On the other hand, it's pretty difficult to build a modern computer platform using bipolar technology. However, there are several other important kinds of radiation. Space environments are also subject to low-intensity, long-term radiation effects from high energy electrons. The magnitude of the radiation depends strongly on the spacecraft's orbit or flight path. Electronics used in nuclear reactors, nuclear medicine, or nuclear weapons may be exposed to gamma rays, x-rays, and/or neutrons. Each of these different kinds of "radiation" may produce different unwanted effects in electronics. There is also a problem with transient dose effects in some circumstances, but I won't go into that here. Sometimes bulk CMOS is the right choice for radiation-hardened electronics, sometimes SOI CMOS is better, and sometimes bipolar technologies are better. If you really want to know the current state-of-the-art in unclassified technology, I recommend the IEEE Transactions in Nuclear Science, particularly the annual proceedings of the Nuclear and Space Radiation Effects Conference. Your assumption that CML is best for Rad hardening and current signatures for side-channel attacks. This is based on old information which is outdated. Although ECL/CML are still immune to the side-channel attacks as the current signature is nearly constant non-existent with differential currents. Differential mode switched currents are still common communication channels today, as they improve immunity to EMI as well. The real improvements in lower silicon impurities are what has made CMOS more robust as well as lower impedance. (25 Ohms in 3.6V) 50 Ohms on 5.5V families.) the impurities are excited to cause partial discharge (PD) and latchup. I have frequently discussed how PD works in this forum for damage, but in this case it is semiconductors. (Opinion) > I have not seen any Rad hardened ECL/CML in recent decades. but in 1985 Honeywell's foundries had Rad Hardened ECL VLSI with 3500 Gates in BGA packages. Rad. 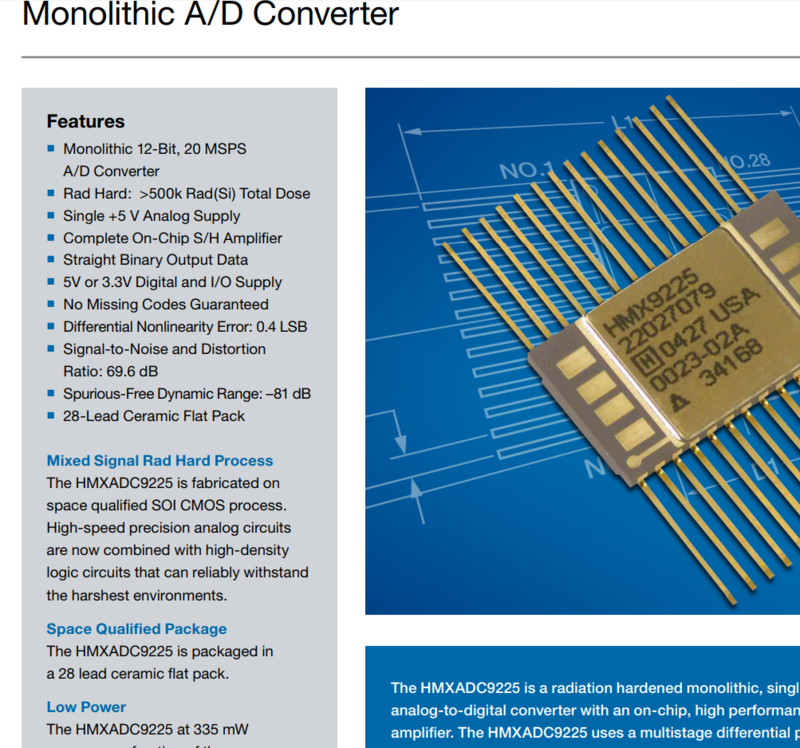 Hardened CMOS seems to be the preferred choice. "The HMXADC9225 will not latch up due to any of the above radiation exposure conditions when applied under recommended operating conditions. Fabrication with the SIMOX substrate material provides oxide isolation between adjacent PMOS and NMOS transistors and eliminates any potential SCR latchup structures. Sufficient transistor body tie connections to the p- and n-channel substrates are made to ensure no source/drain snapback occurs." Not the answer you're looking for? Browse other questions tagged digital-logic bjt or ask your own question. Are there still use-cases for ECL? Why are the transistors in logic circuits used in saturation region for ON state?